More than almost any other accessory, the right belt has the power to instantly transform your outfit. Flowy shift dress? Waist belt to the rescue. Boxy tunic? Yet another job for the belt. Oversized blouse? Just belt it and call it a day! See what I mean? Now normally I would tell you that every girl needs to invest in at least two good basic belts—one brown and one black. This Sonia Rykiel belt, however, cuts that number in half! Incorporating brown and black into one outfit can be tricky, but having a single piece that incorporates both colors takes the guesswork out of mixing your neutrals. Plus, I’m just obsessed with the mixed textures and gold hardware! Looking for another great on-trend way to mix your neutrals? Leopard print! (Bonus: This leopard-print MICHAEL Michael Kors belt is reversible for an all-black look.) 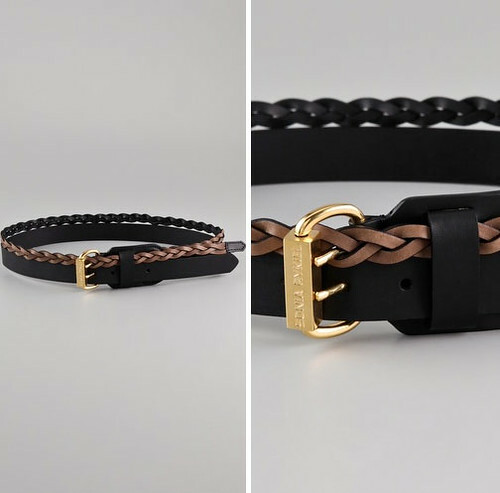 Or, if you’re looking for a more affordable option, try Forever 21’s wallet-friendly Woven Contrast Belt. What's your most versatile accessory? P.S. For more where this came from, make sure you're following me on Twitter!